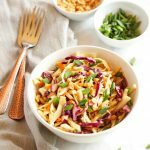 This Asian Cabbage Salad with Ginger Peanut Dressing is a healthy, easy to make Thai inspired side dish made from simple, wholesome ingredients! This salad is best enjoyed the day it's made, but the dressing can be made ahead of time and stored in the fridge for 2-3 days. Using coleslaw mix from your grocery store also works well for this recipe as another way to save time!